Do you want authentic Indian cuisine, in the heart of the CDB, at affordable prices? Well, Spice Kitchen offers all that and more. Word of mouth about this establishment's extensive menu and quality service continues to grow. With two locations - 157 Lonsdale Street and 530 Collins Street, Spice Kitchen is well-known for offering Lunch and Dinner Buffet Specials at only $14.95! That's all you can eat, every Lunch and Dinner. If your more inclined to order from the extensive menu, try the Vegetarian Platter (14.90), which includes a selection of Samosa, Onion Bhaji, Gobi Manuchuri and Tandoori Mushroon, also try the Tandoori Chicken (Half $8.00/Whole $15.00) or Chicken Tikka ($9.90). 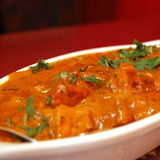 Mains include classic dishes such as Butter Chicken ($13.90), Lamb Rogan Josh ($13.90), Beef Vindaloo ($13.90), Goan Fish Curry ($15.90) and Dhal Makni ($10.90). Side Dishes of Rice (3.50), Naan ($3.00) and Pappadam ($1.00) are also available. Finish your meal with some items from the dessert menu, including Kheer ($5.50) and Kulfi ($6.00) and traditional drinks such as a Lassi ($3.00) or Masala Chai ($2.60). Open Monday to Thursday 11:30 am to 9:30 pm and Friday and Saturday 12 noon to 10pm. When: Monday to Thursday 11:30 am to 9:30 pm and Friday and Saturday 12 noon to 10pm.